Find out how you can join Mercato Centrale's The Next Big Food Entrepreneur 2015. Ever wonder how great food businesses start? Mercato Centrale co-founders Anton Diaz and RJ Ledesma have a track record of identifying successful food entrepreneurs. Great foodie faves like Mochiko, Manang’s Chicken, and Merry Moo (and many, many more!) all got their start at this popular street food market. With this passion for food and entrepreneurship, Mercato Centrale brings you The Next Big Food Entrepreneur (NBFE), a three-phase event that pools together a group of aspiring food entrepreneurs with unique and sustainable product offerings, test them out in the real market, and determine if they can truly cut it! 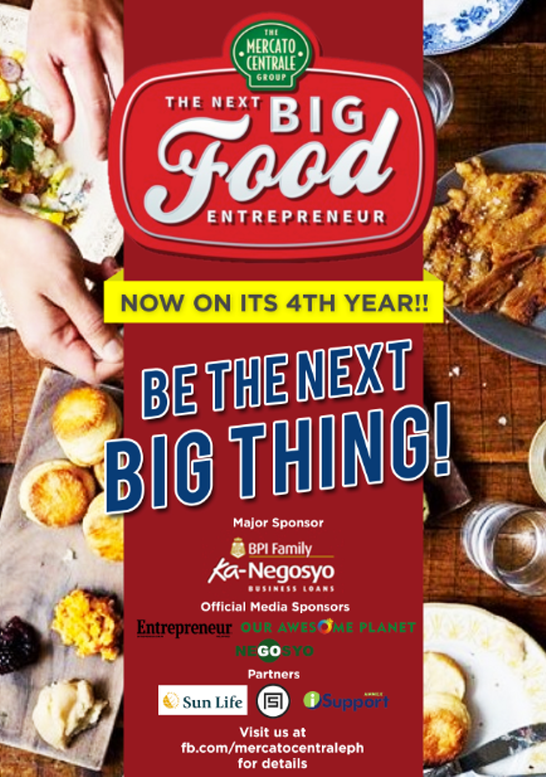 Now on its 4th year, The Next Big Food Entrepreneur is in search for the next winner of P100,000 in start-up capital, 6 months rent-free stay at a Mercato Centrale market, mentoring sessions with Mercato Centrale’s very own Anton Diaz and RJ Ledesma, and a special feature on Entrepreneur Magazine! Application deadline on November 8, so send in yours now! Visit Mercato Centrale’s Facebook page (mercatocentrale) to download the application form and learn more about the competition! For inquiries, please email admin[at]mercatocentrale.ph!